The National Oceanic and Atmospheric Administration has boiled down ten years of weather into just 3 minutes; a decade of summer rain, winter snow, the touchdown of hurricanes Katrina and Sandy, midwestern tornados and of all the other weather events that have impacted the Eastern U.S. 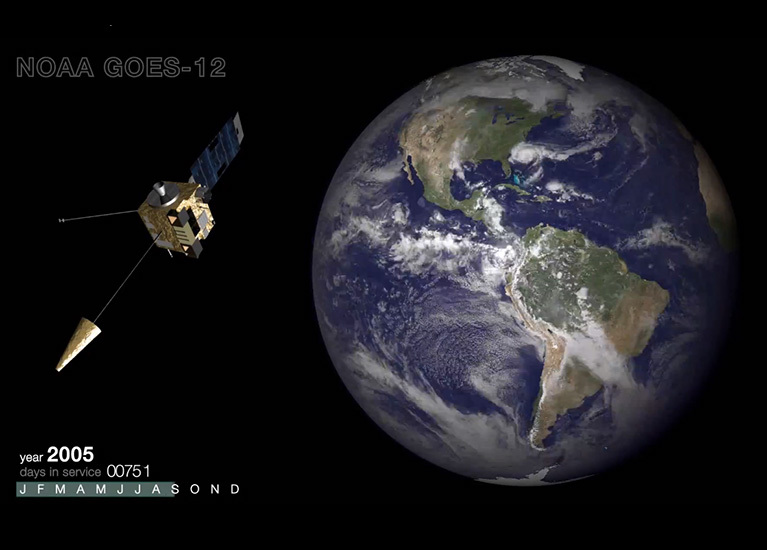 The GOES-12 satellite is being retired after a decade of weather monitoring along the eastern U.S., but its life’s work can now be watched thanks to the NOAA. The Geostationary Operational Environmental Satellite (GOES-12) was launched in 2001 to help set up a weather observation system for the U.S. It remained in a fixed position above its target – being geostationary – where it has monitored weather patterns and storm systems around the U.S. East Coast and parts of the Atlantic Ocean. That entire 10-year run has been compressed down to a 3-minute video by the National Oceanic and Atmospheric Administration (NOAA), and made available for our viewing pleasure. Hurricane Katrina comes into the picture around the :44 mark and Sandy around 2:49.